As with most kids, I have trouble getting mine to eat their greens. 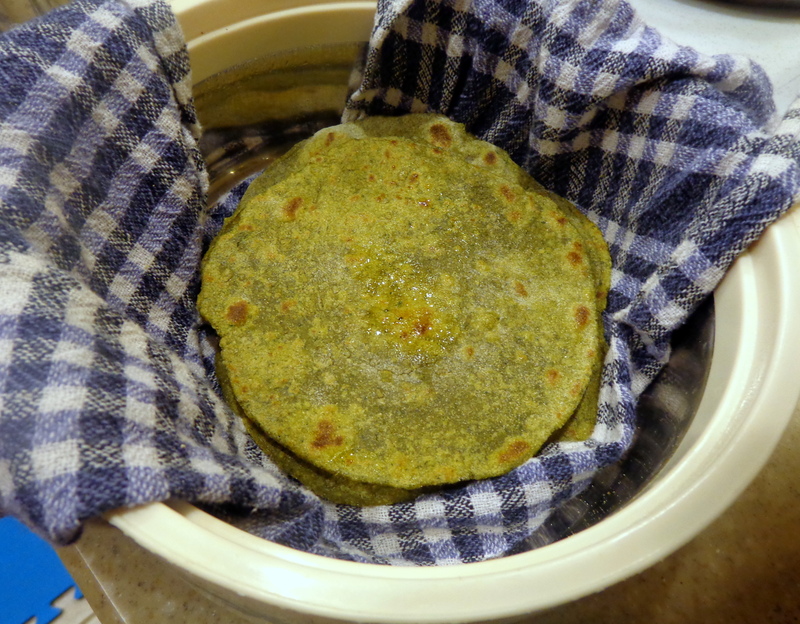 I have been successful in making these green rotis that they really love. 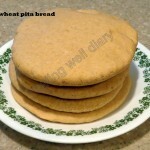 These days I do not make plain chapatti at all, always mixed with pureed/cooked greens. 1. Adding some spices helps with flavor. Even slightly bitter greens can be used. 2. Kneading a very warm dough. I use a stand mixer for this purpose. Can be kneaded by hand too. 3. Letting the dough rest for a while in a closed container. It actually makes better rotis after a day in the fridge! 4. I use a cast-iron skillet at medium-high heat, no oil. Keeping this skillet dedicated for flat breads makes it easy to maintain and keeps the quality of rotis excellent. 5. 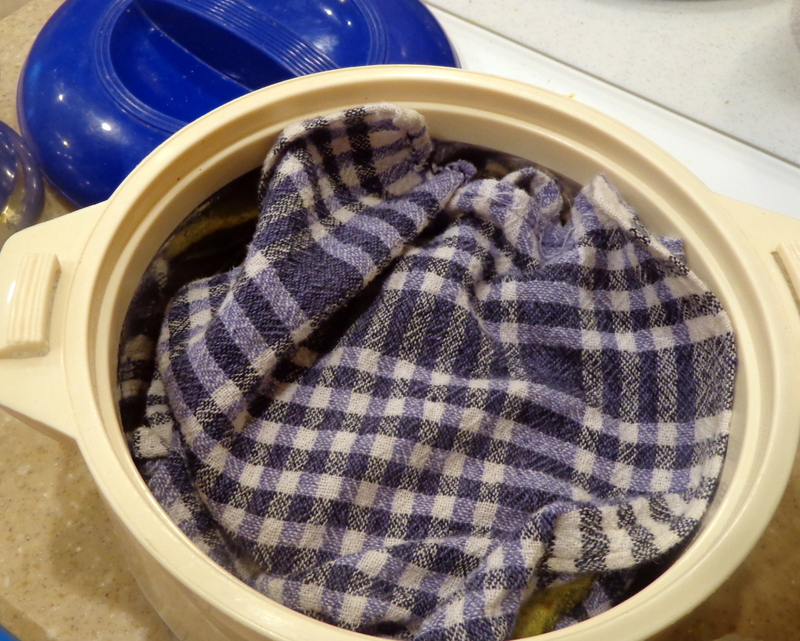 Storing the bread wrapped in a cotton towel in a casserole till serving time. 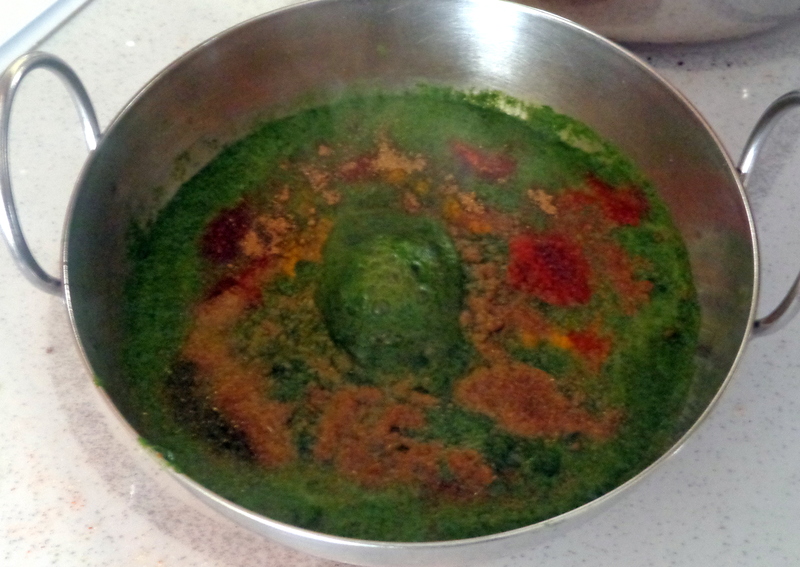 * Wash spinach and puree in a blender with about 1/4 cup water. 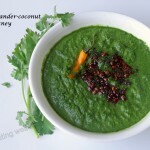 * Heat the pureed leaves in a pan and bring to a boil with the addition of spices and salt. 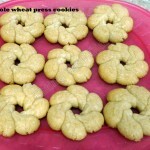 * Measure out wheat flour in a stand mixer, add hot/warm cooked greens and knead with dough hook. Add additional water to form a ball of dough. * Let the dough rest in a closed bowl for a few hours. You could prepare the side dish during this time. * Roll out thin circles on a floured surface. Use additional flour. * Transfer to a pre-heated skillet. 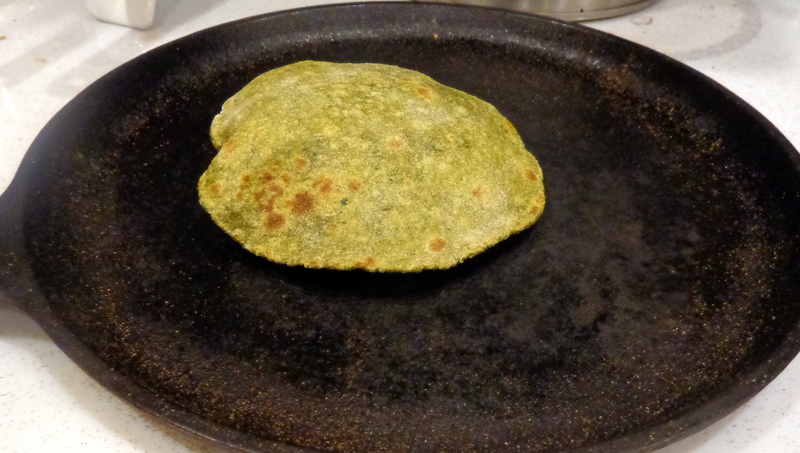 Wait for 30 seconds or till the roti picks up heat. Flip. * Gently press with a cloth and let it puff or wait till brown spots appear. Repeat on the other side. * Transfer to a cloth-lined casserole. Smear with ghee (optional). Stack more rotis the same way. Yes, Vidya. It makes them very flavorful. Looks yum Apsara.. My MIL keeps telling me to try this method and I keep forgetting and just make plain ones instead..just can’t shake off the lazy in me and my daughters one fussy eater too. About time I cooked some..will try soon. thanks, Sanjana. I hope you daughter likes these! They remind me very much of flour tortillas. Those flavored with spinach are a modern variation. Your rotis look delicious! Looks delicious Apsara and very useful tips….feel like grabbing one…..
Good job…this is going green in the real sense! 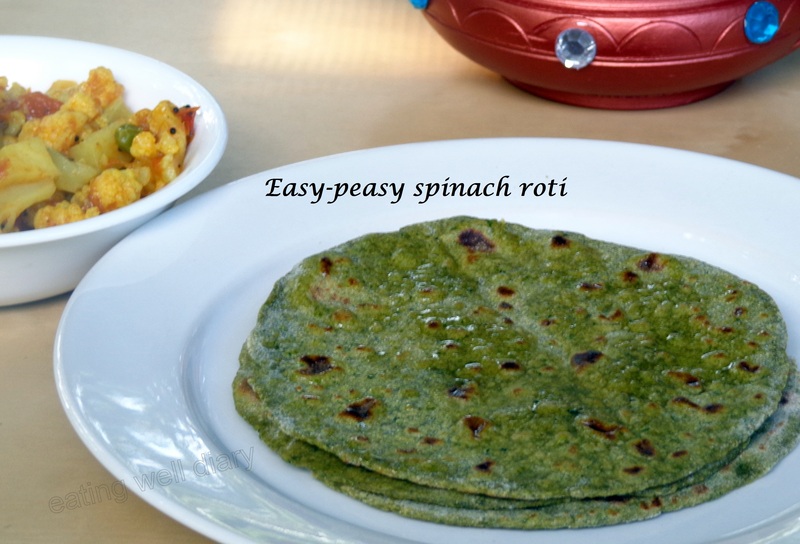 I have had roti at my friends homes but have never really thought of making it at home, I love that this has spinach and is a type of roti that I would actually have to try making at home as I am curious to how this would taste! 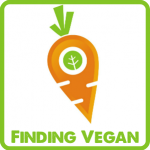 Do try it, you will not be disappointed! Do you make other types of flat breads then? I seem to have missed seeing this when first posted. 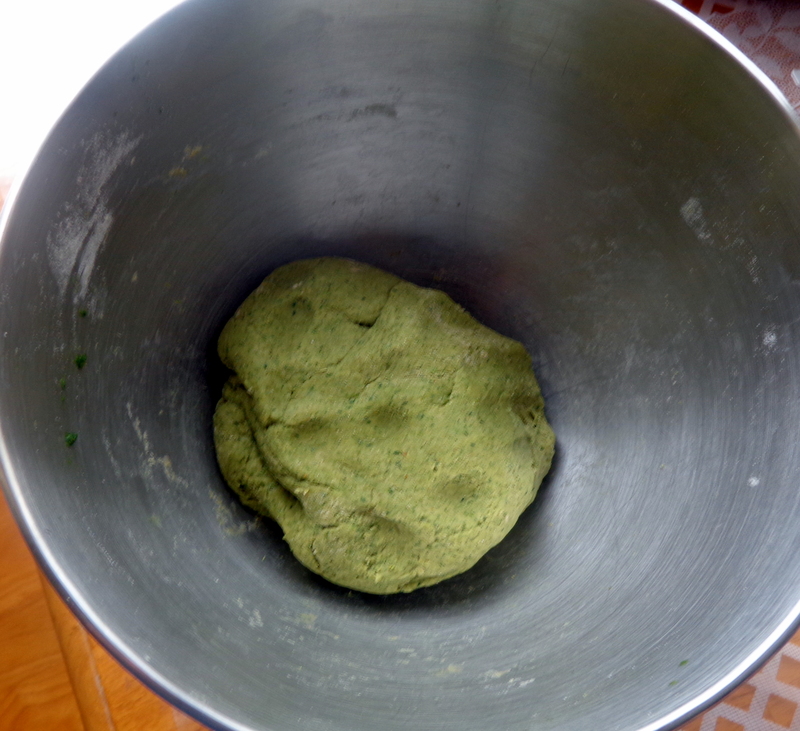 I came across it today and have made the dough with wild greens instead of spinach. Would it be ok with you if I post it and give your link? That is if they and the photos turn out? absolutely! thanks for asking, Hilda. 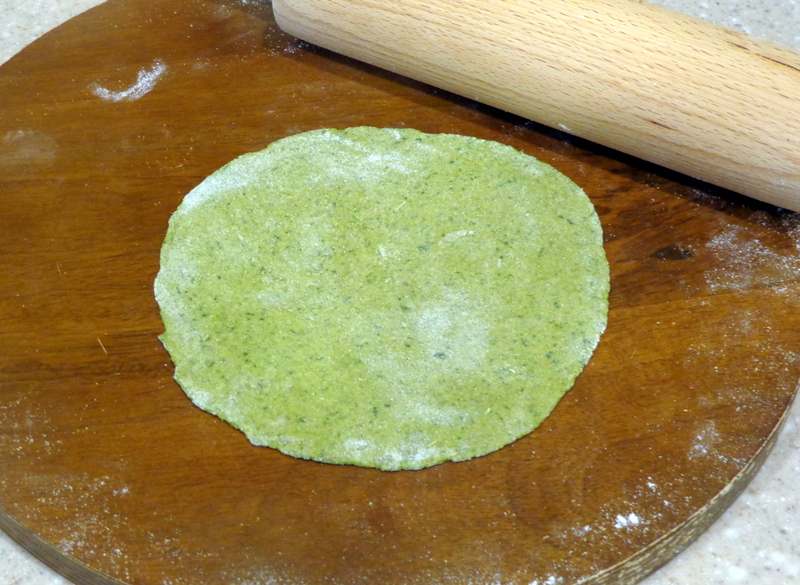 I made your roti with my lambsquarters, but the pictures were not very good – so hope to try again. They were delicious. Spelt flour! That’s a great idea. Thanks, Sophie!